According to the Ekottara Agama Sutra (增一阿含�), the first Buddha image was made of wood. It is said that when the Buddha was teaching his deceased mother in the Trayastrimsa heaven, King Udayana of Vatsa in ancient India could not bear his absence and thus made a sandalwood image of the Buddha. 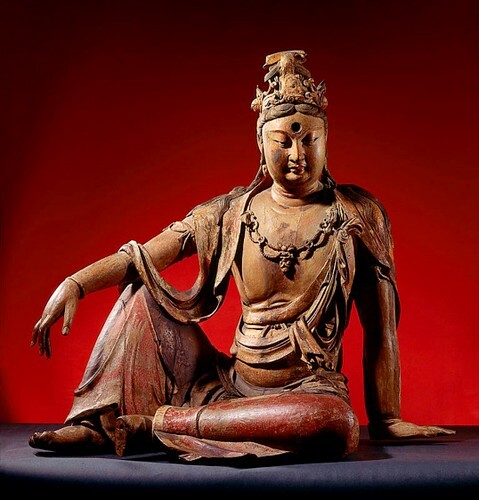 In China, wooden sculptures have been produced throughout the history of Buddhism. However, as the craft was mainly passed down orally among artisans, little is known about the wood species and construction techniques involved. 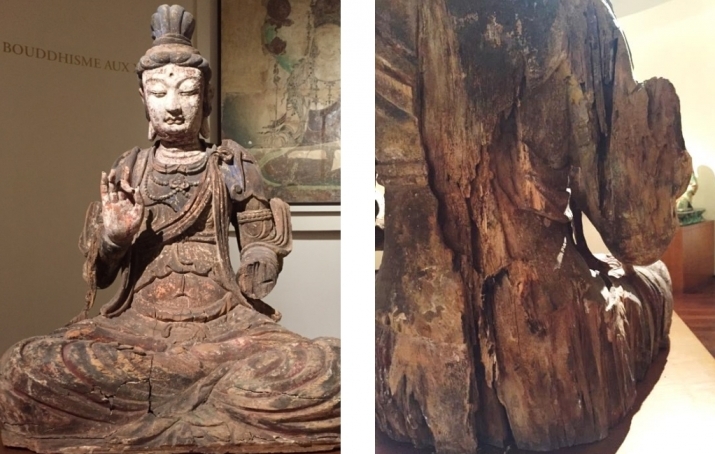 In Japan, where wood is a more predominant and widely used material in sculpture, there have been systematic and scientific studies since the 1960s,* while in China similar work has not been conducted. 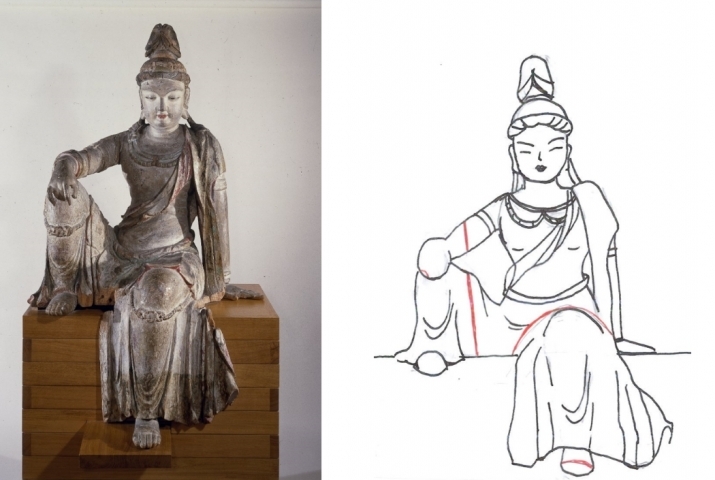 To investigate how Buddhist sculptures were made in China, I synthesized the abovementioned scientific studies, cross-referenced Buddhist and art historical literature, and observed specific objects in museum collections. It is by no means a comprehensive study, but it is still possible to illuminate some characteristics of the subject and clear away some misconceptions that have been held even among scholars. Through microscopic identification, the following wood species were identified: willow (柳), poplar (杨树), limewood or linden (椴木), foxglove-tree (泡桐), juniper (刺柏), and sandalwood (檀香) at the genus level, and at the species level, Euphrates poplar (胡杨) and Formosan sweetgum (枫香树). As indicated in the table below (Fig. 2), during each period, various species of wood were used; most wood species were used continuously throughout history. There does not seem to be a pattern as is the case in Japan, where certain types of wood became dominant in a specific period. Moreover, we found that the choice of wood was mainly determined by availability and suitability for carving, rather than by religious significance as some would like to believe. For example, the use of willow has been attributed to the depiction of the willow branch in Guanyin iconography, but it was also used to carve images of the Buddha and arhats (Fig. 3). In fact, the choice of material was less symbolic than practical: willow is cultivated in temperate regions in North China, and all willow sculptures are either from the provinces of Shanxi or Hebei, or identified as from the Liao and Jin dynasties, which wielded power in that region. Indeed, the Lotus Sutra de-emphasizes the choice of materials, asserting that the action of making an image itself leads to attainment of the Buddha way. It is evident, however, that the religious significance of sandalwood persisted. The Eleven-faced Avalokitesvara Heart Dharani Sutra (十一面神咒心�), translated by Xuanzang (c. 602�C664), prescribes that the efficacy of this dharani can only be invoked when one prays in front of a sandalwood Guanyin image. 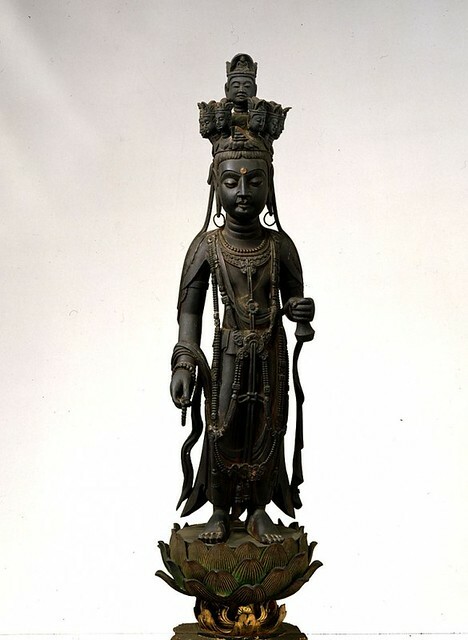 A sandalwood eleven-headed Guanyin, dated to the Tang dynasty (618�C907) (Fig. 4), offers a telling example of how this text was faithfully emulated in Buddhist ritual. In terms of construction techniques, two main methods are revealed by X-ray radiography: single-block carvings and composites of multiple blocks, depending on the posture of the figure. Standing sculptures were carved from a single log, while seated images all have a massive central block as the base, with additional blocks joined together with tenons, dowels, and glue, before contours and details were carved out. Nevertheless, there seem to have been no standardized techniques in China for assembling blocks, and the number of blocks used was determined by the width of the central piece (Figs. 5 and 6). 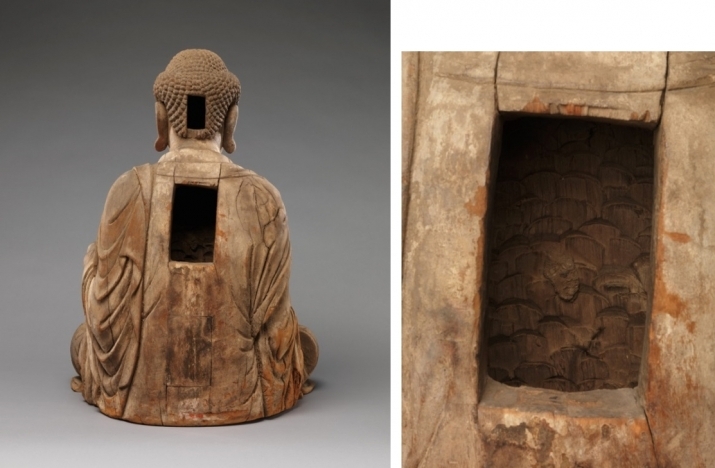 A number of sculptures were found to be hollow, with openings on the back and sometimes at the back of the head, which were originally covered by wood planks (Fig. 7). In one case, the inner surface of a plank used on a bodhisattva sculpture was inscribed with details of the statue’s creation (Fig. 8). It documents that this sculpture was one of three bodhisattvas commissioned by the residents of Dong’an village for a local temple in 1385, and constructed by Feng Xiaozhong and his son. However, we should not assume that all the cavities in these sculptures were intended to be consecratory chambers or to hold relics. When we look at the interiors of some of the back chambers, it is evident that the wood was cut away with a rather thick, curved chisel, leaving a very uneven surface that does not appear to be intended for use as a sacred space. In fact, while dated inscriptions were a common practice and can be found in a wide range of Buddhist objects, the consecration of sculptures was not always a concern. I am more inclined to a technical explanation: because heartwood shrinks at a slower rate than sapwood, the former must be removed to minimize cracking and warping as the wood dries after being cut. As we can see in the case of the carving of a seated Guanyin dated to the 10th century, where the heartwood was not removed, the structure has split along the grain of the wood, creating severe cracks (Fig. 9). Pigments and coatings were not the focus of our study, but X-ray fluorescence and light microscopy reveal that a whitish kaolin-based clay ground was applied to the wood substrate, followed by paint layers. The selection of pigments was quite consistent throughout this period of history: indigo, vermilion, red ochre, azurite, malachite, lead white, orpiment, ultramarine, atacamite, and botallackite were among the most frequently used. Almost all the sculptures retain traces of gilding. Sometimes lacquer can also be found on top of the gilding, possibly as a varnish. Lastly, we should be reminded that because wood is much more vulnerable to fire, damp, and insects than materials such as metal and stone, wooden sculptures are often restored and repainted repeatedly after their initial construction. We observed that wood blocks had been replaced in many sculptures, as well as new campaigns of polychromy, multiple layers of gilding, and the addition of machine-made nails, which only came into being during the 19th�C20th centuries. In fact, to restore their “original” appearance, some museums had stripped away later decorative schemes―a treatment that does not please all. 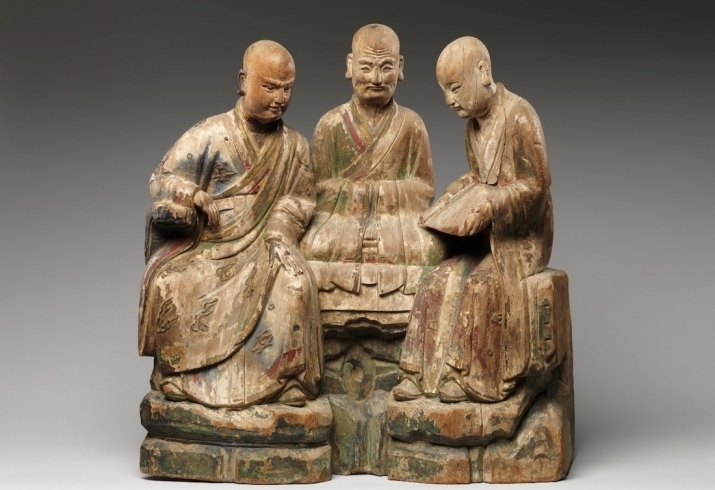 Over the centuries, the basic methods of making Buddhist wooden sculptures in China do not seem to have changed much. Many decisions were possibly made by the chief artisans, based on their creativity and sense of aesthetics, as well as the availability of materials and craftsmanship. 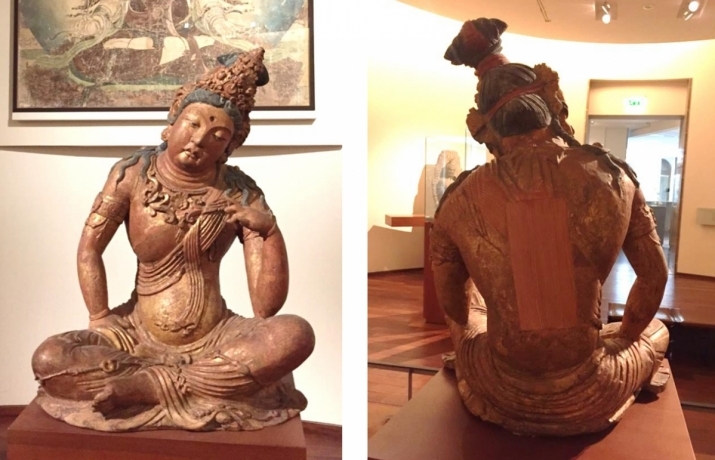 We are very fortunate today to be able to see these wooden sculptures, which have survived for hundreds of years. More research is needed for a better understanding and conservation of these wonderful examples of Chinese Buddhist heritage. * Kohara, Jiro. 1963. “Nihon chokoku yozai chosa shiryo” (Data on the Investigation of the Wood Material Used for Japanese Sculpture). Bijutsu Kenkyu 229: 74�C83. Leidy, Denise Patry and Donna Strahan, eds. 2010. Wisdom Embodied: Chinese Buddhist and Daoist Sculpture in The Metropolitan Museum of Art. New York: Metropolitan Museum of Art. Mertz, Mechtild and Takeo Itoh. 2010. “Analysis of Wood Species in the Collection”, in Denise Patry Leidy and Donna Strahan, eds. 2010. 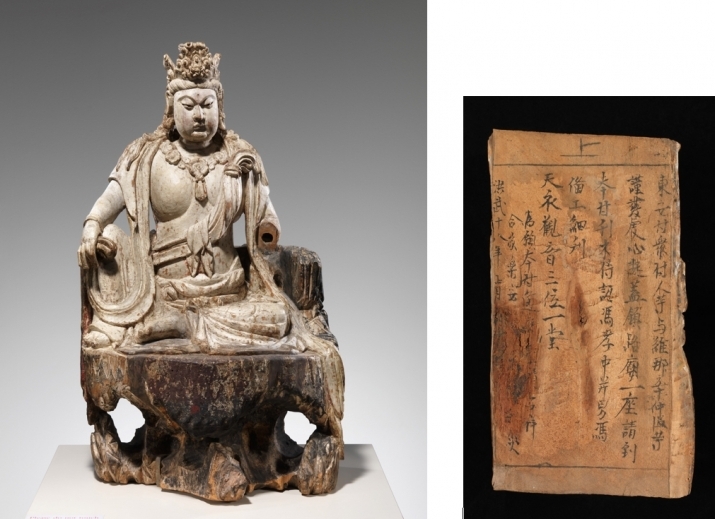 Wisdom Embodied: Chinese Buddhist and Daoist Sculpture in The Metropolitan Museum of Art. New York: Metropolitan Museum of Art: 216-225. ―――. 2007. 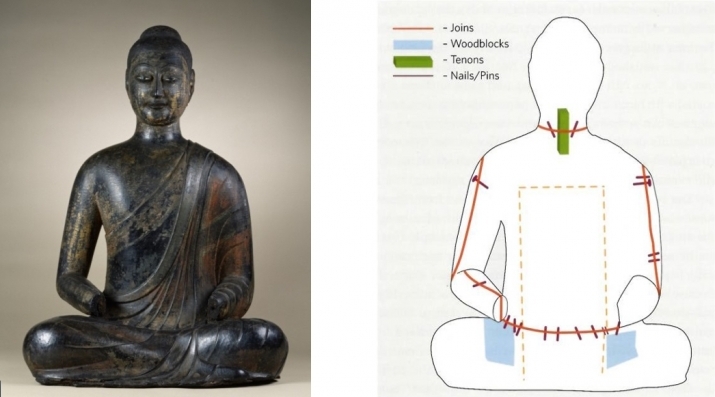 “The Study of Buddhist Sculptures from Japan and China Based on Wood Identification,” in Janet G Douglas et al., eds. Scientific Research on the Sculptural Arts of Asia: Proceedings of the Third Forbes Symposium at the Freer Gallery of Art. London: Archetype: 198�C204. Rӧsch, Petra. “Chinese Buddhist Wood Sculptures of Water-Moon Guanyin: A Preliminary Research in Their Wood Construction and Material,” in Ibid: 205�C12.